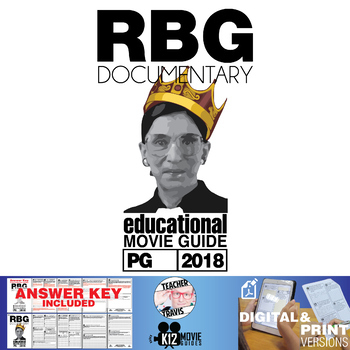 The RBG - Ruth Bader Ginsburg Documentary Movie Guide | Worksheet (PG - 2018) introduces students to RBG's life and her ground breaking contribution to the women's rights movement. Explore the cases RBG argued in front of the Supreme Court during the 1970s. Contemplate what politicians and regular citizens can learn from her relationship with Justice Scalia. Ask students to compare and connect their own experiences in life to RBG and her work. 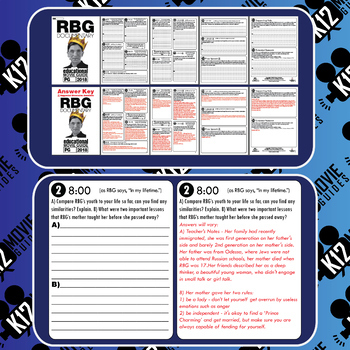 Check the preview file for high resolution sample questions to see if this movie guide is suitable for your students. This resource consists of 14 high-level, short answer reflection and essay questions that will do more than just ask your students to regurgitate information. Although this movie guide doesn't have many ratings yet, please don't be overly concerned as it was posted more recently than my other resources. Please visit MY STORE to see almost 2,000 ratings with a perfect ★★★★ average. Get Free Money with TPT Credits!